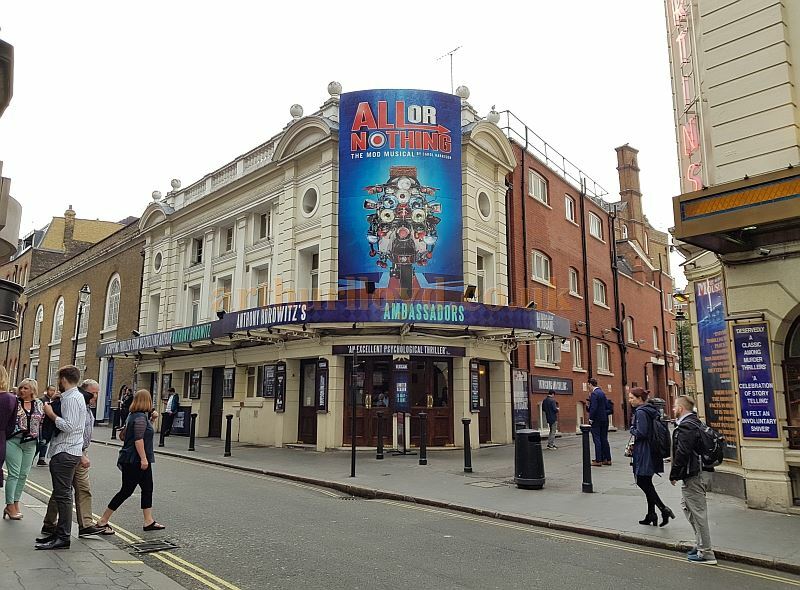 Above - The Ambassadors Theatre during the run of 'Mind Games' in May 2018 whilst still showing signage for the former production at the Theatre of 'All or Nothing'. 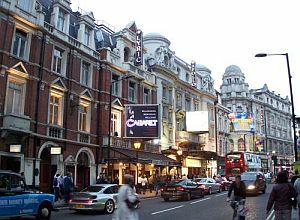 The Ambassadors Theatre opened on Thursday the 5th June 1913 with a production of the play 'Panthea' by Monckton Hoffe. The original plan was to build two Theatres side by side at roughly the same time but the outbreak of the first world war caused the building of the second Theatre, St. Martin's, to be delayed until 1916. 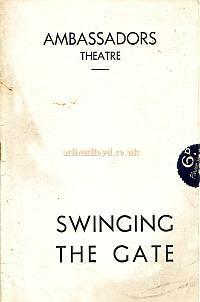 Right - A Programme for 'Swinging The Gate' at the Ambassadors Theatre in 1940, which was a sequel to 'The Gate Revue' of 1939. 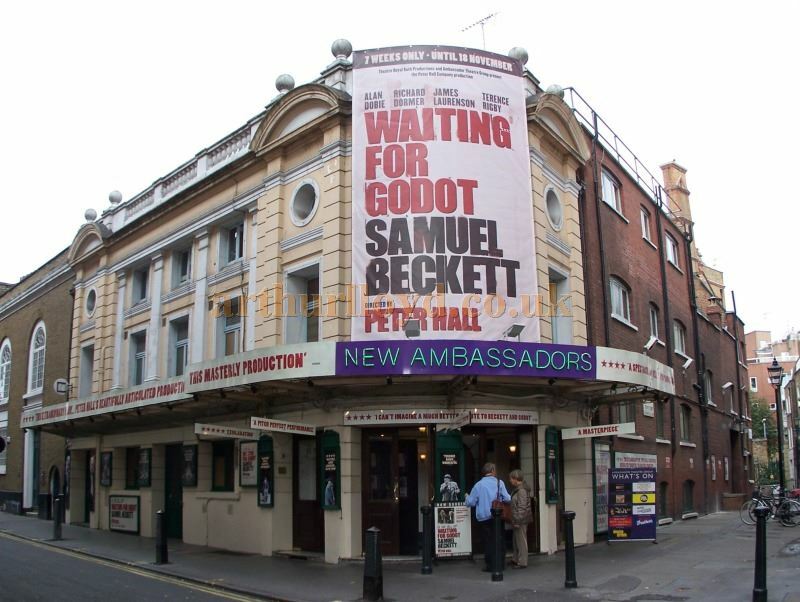 Because the Ambassadors Theatre was constructed before the building previously on the site of the St. Martin's Theatre had been demolished, the Ambassadors Theatre itself had to be lower than originally intended so as not to interfere with the 'ancient lights' of the other building. Hence the reason that the stalls of the Ambassadors Theatre is below ground level. Both Theatres were designed by the well known Theatre Architect W. G. R. Sprague. 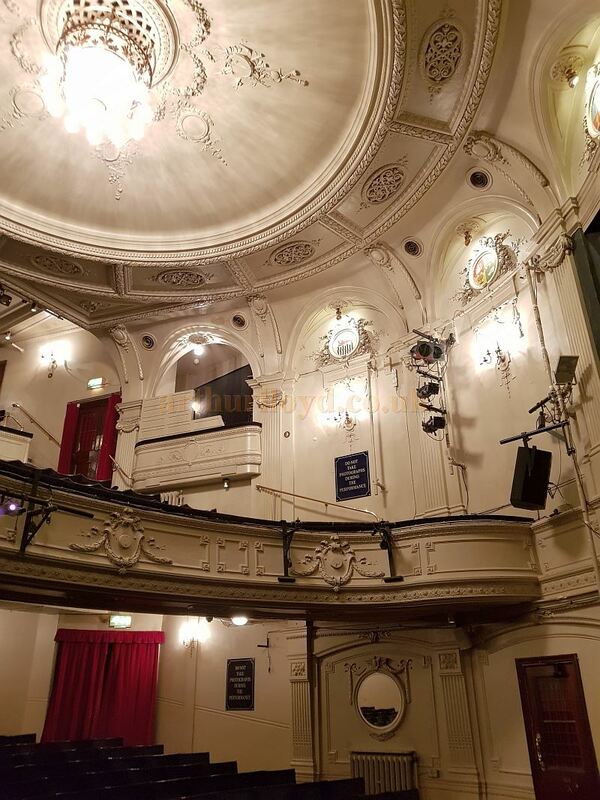 Above - The Auditorium of the Ambassadors Theatre in May 2018 - Photo M.L. 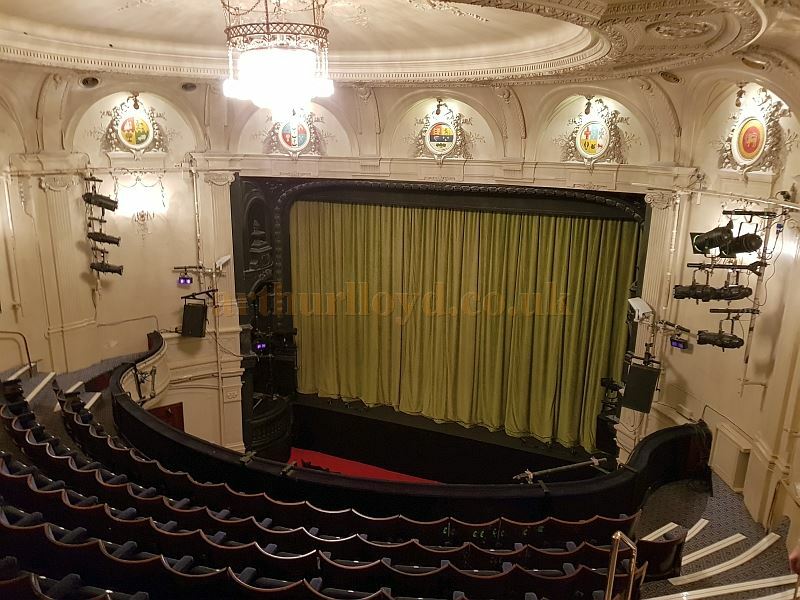 The ERA reported on the Theatre's opening in 1913 saying:- The general scheme of decoration is Louis XVI and the colour scheme of Parma violet ivory, and dull gold is a refreshing change to the warm colours usually selected in decorative schemes. 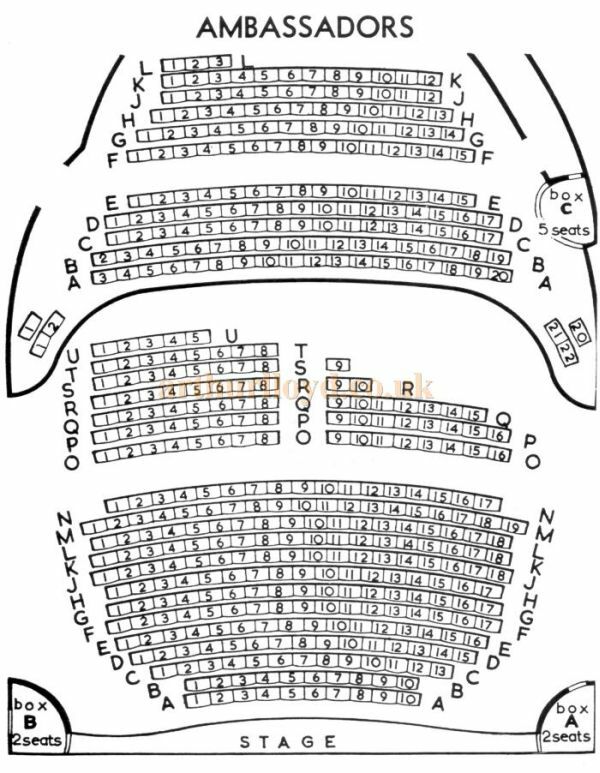 The Auditorium is arranged with a commodious stalls area, behind which is a good roomy pit, and above this level is the dress circle, and forming part of the same tier is the family circle, or upper boxes, sufficiently raised to form another distinct circle.' - The ERA, 1913. 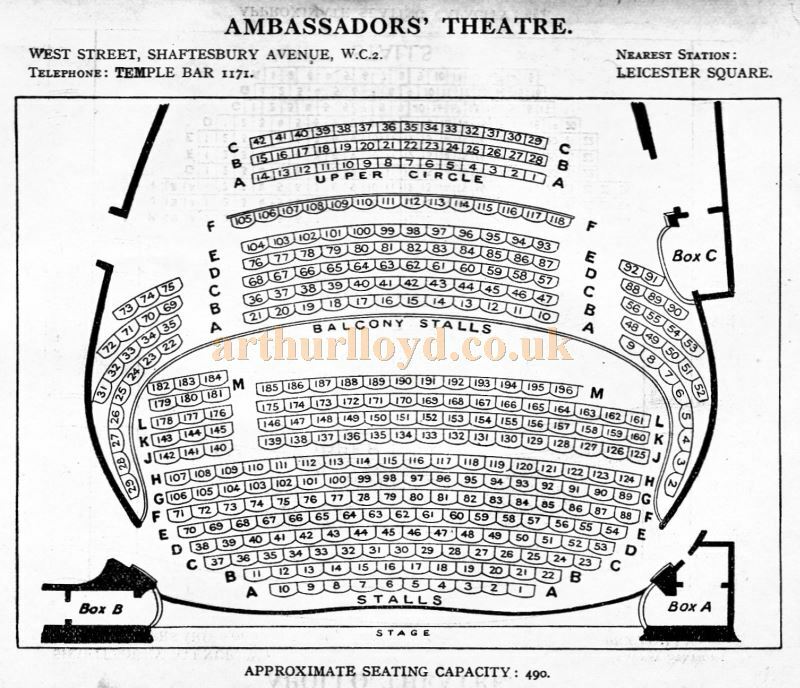 Right - A Seating Plan for the Ambassadors Theatre, probably from the 1920s. The Stage Newspaper also reported on the opening of the Ambassadors Theatre in their June 12, 1913 edition saying:- 'This new theatre, which was opened on Thursday by Mr. Durrant Swan with Panthea, a new play from the pen of Monckton Hoffe, stands at the corner of West Street, Shaftesbury Avenue, midway between Cambridge Circus on the one side and Great St. Andrew Street on the other. 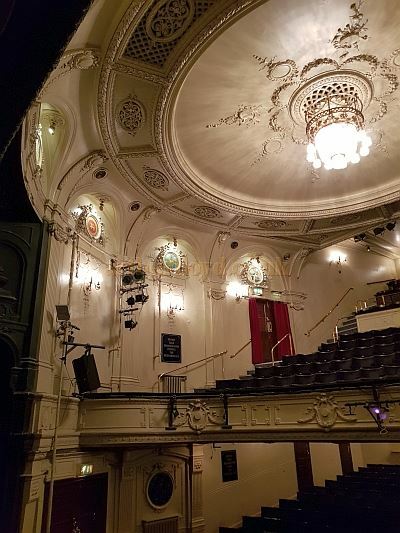 It is a one-tier house, decorated chiefly in white and gold, with a seating capacity of about 500, there being two rows of stalls and some dozen of pit on the ground floor, and the comparatively spacious and lofty tier above being divided into balcony stalls and upper circle. 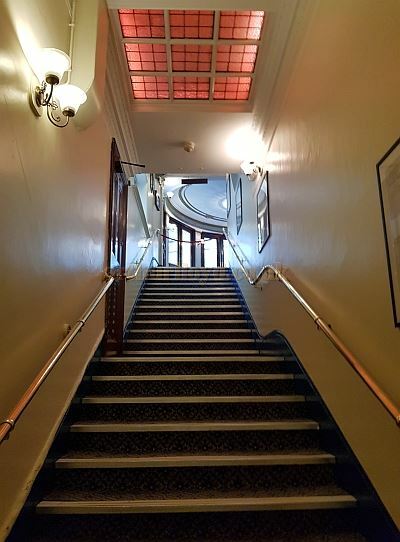 Left - The Stairs to the Stalls from the Foyer of the Ambassadors Theatre in May 2018 - Photo M.L. The stage is large enough to accommodate productions of the drawing-room drama, musical piece, and even romantic drama classes, the three sets, by J. A. Fraser and W. H. Davies, used for Panthea, being displayed to considerable advantage. This fresh bijou house, which has been erected from the designs and under the superintendence of Mr. W. G. R. Sprague, has for [its] proprietors, The Ambassadors Theatre, Limited, Mr. Herbert Jay being the managing director and licensee. 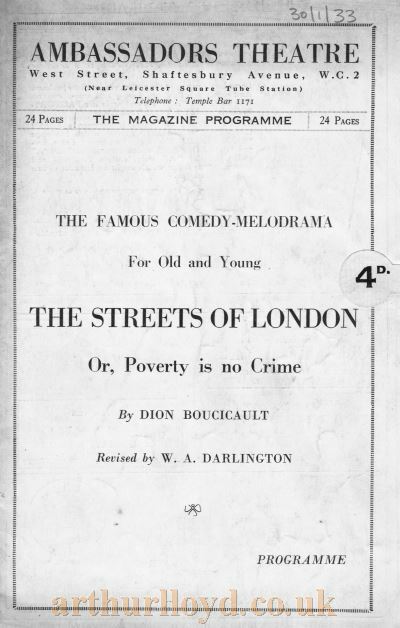 Right - A programme Cover for a production of 'The Streets of London' at the Ambassador's Theatre in January 1933. The above text (edited) in quotes was first published in The Stage, June 12, 1913. Above - A Seating Plan for the Ambassadors' Theatre - From 'Who's Who in the Theatre' published in 1930 - Courtesy Martin Clark. Click to see more Seating Plans from this publication. 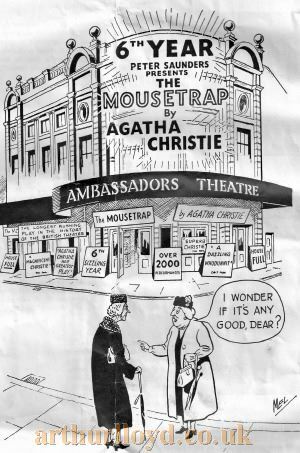 The world's longest running play, 'The Mousetrap' by Agatha Christie, started its run at the Ambassadors' Theatre on the 25 November 1952, with Richard Attenborough and his wife Sheila Sim heading the cast, before moving to the St. Martin's Theatre next door in 1974, where it is still going strong today. 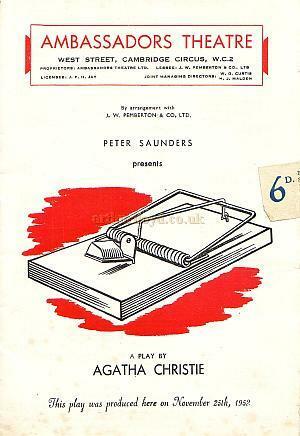 Right - An early Programme for 'The Mousetrap' at the Ambassadors Theatre with Richard Attenborough still in the cast, although his wife, Sheila Sim, was no longer in the play. - Click to see the Entire Programme. And an advertisement carried in a programme for 'Simple Spyman' at the Whitehall Theatre in the 1950s - Courtesy George Richmond. In November 2012 the production celebrated its 60th year in the West End. An advertisement carried in a programme for 'Simple Spyman' at the Whitehall Theatre in the 1950s (shown here) shows two women outside the Ambassadors Theatre during the 6th year of 'The Moustrap'. Even then it had clocked up over 2,000 performances and was being billed as the longest running play in the history of British theatre. 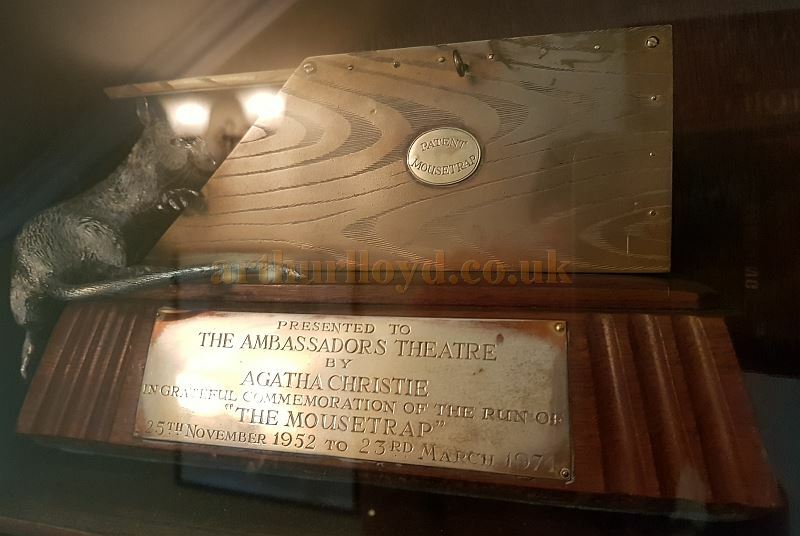 Above - A Plaque situated in the Ambassadors Theatre Foyer which was presented by Agatha Christie to commemorate the run of 'The Moustrap' at the Theatre from the 25th of November 1952 to the 23rd of March 1974 when it transferred next door to the St. Martin's Theatre - Photo M.L. May 2018. 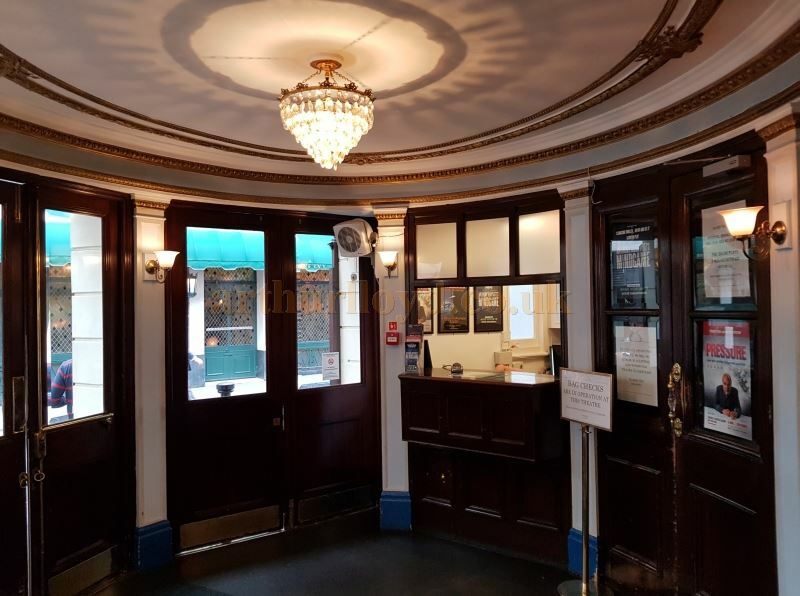 Above - The Foyer and Box Office of the Ambassadors Theatre in May 2018 - Photo M.L. 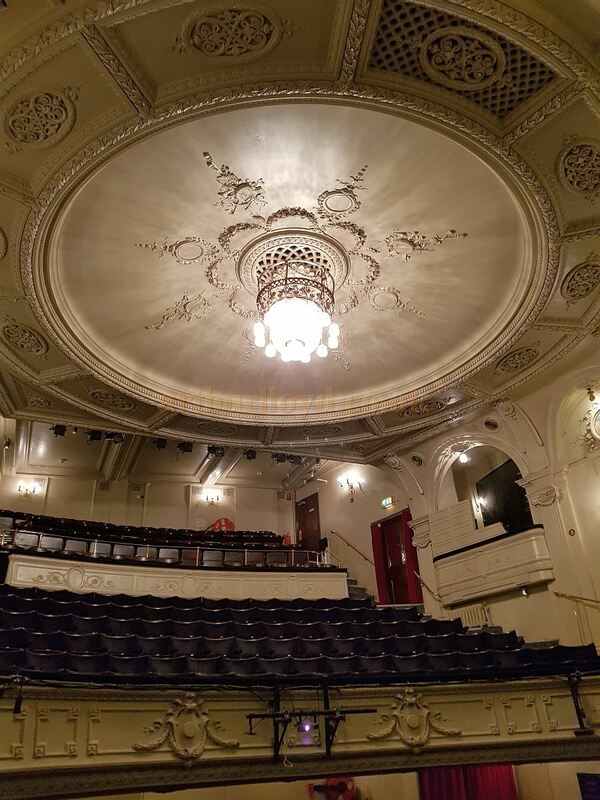 In 2018 the Theatre was under consideration by Delfont Mackintosh Theatres who planed to purchase it from its then owner, Sir Stephen Waley-Cohen, and radically reconstruct the Theatre and reopen it under the new name of the Sondheim Theatre. 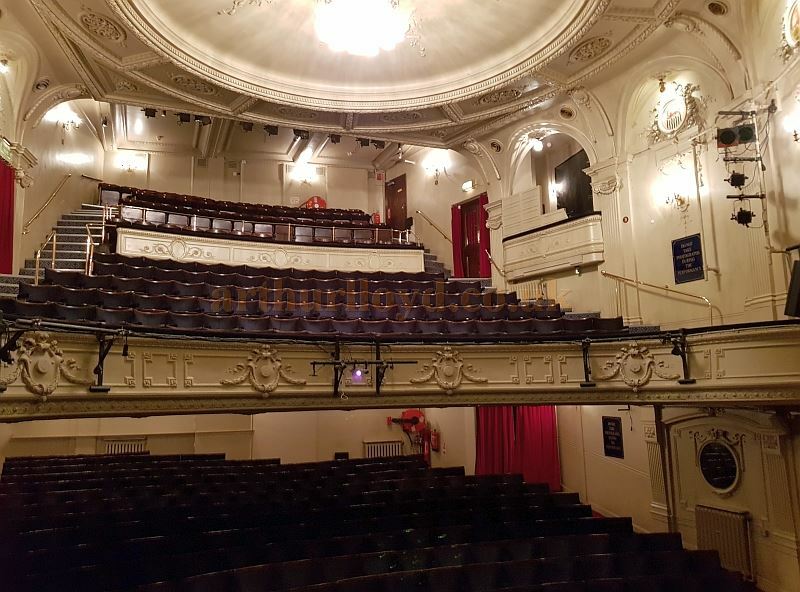 Right - The Auditorium of the Ambassadors Theatre in May 2018 - Photo M.L. 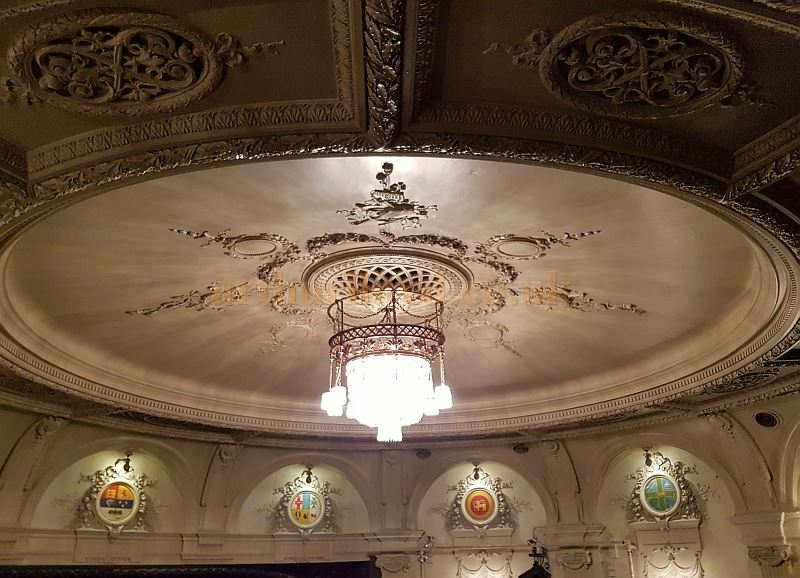 Whilst a new Theatre in London's West End is always welcome, the destruction of W. G. R. Sprague's wonderful auditorium and a partial reinstatement of it in the Theatre's bar was certainly controversial. 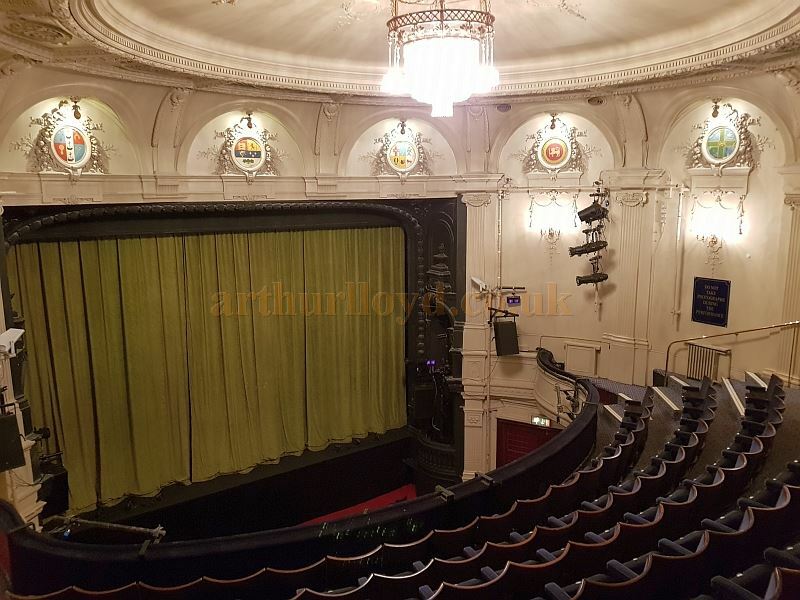 Left - The Auditorium of the Ambassadors Theatre in May 2018 - Photo M.L. However, the owner pulled out of the deal in October 2018 and so the conversion plans did not come to fruition. The Theatre was instead taken over by ATG Theatres who plan to refurbish the Theatre in the near future. 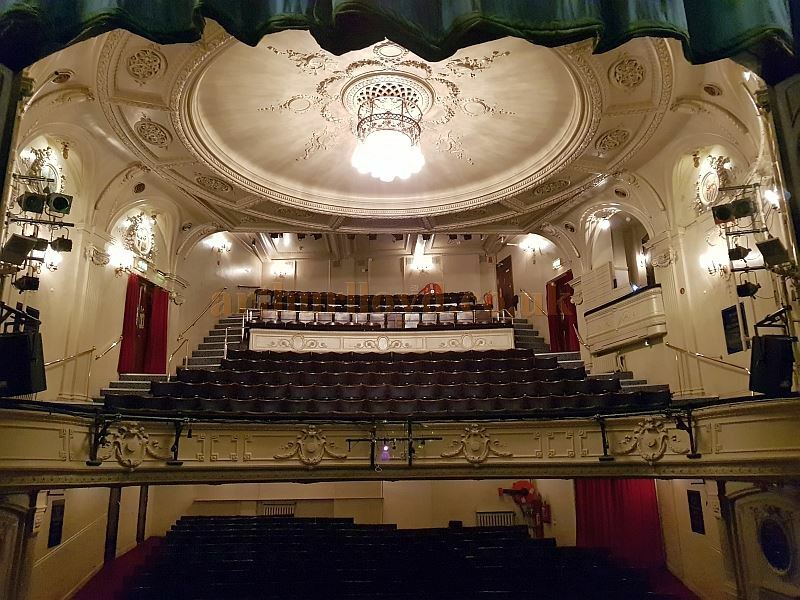 Some photos of the auditorium taken in May 2018, with kind permission of the Theatre's Manager, can be seen above and below. 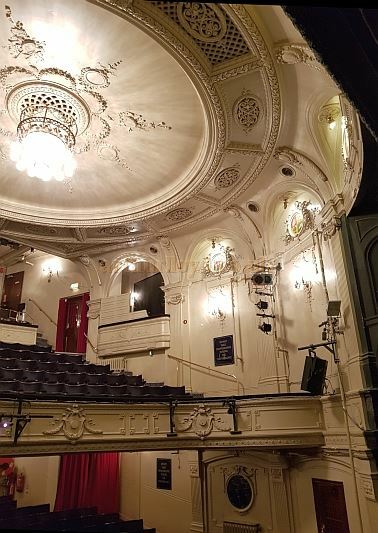 Above - The Auditorium and Proscenium of the Ambassadors Theatre in May 2018 - Photo M.L. 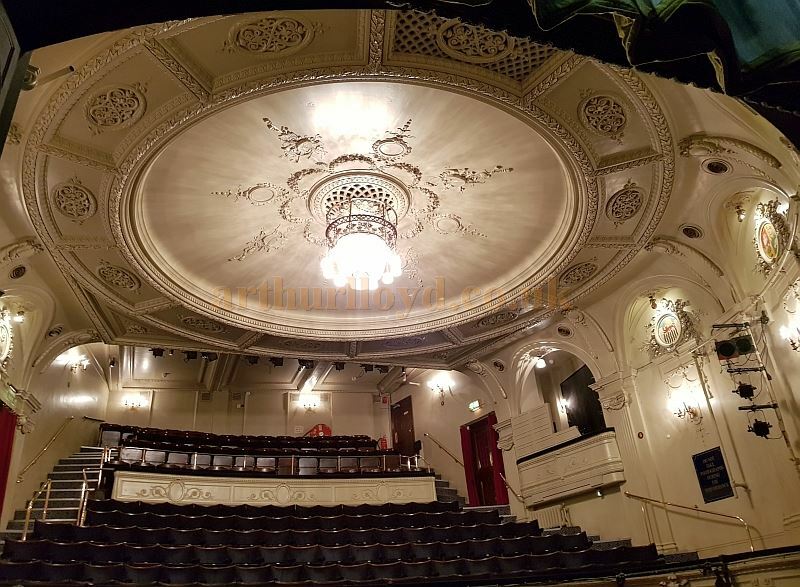 Above - The Auditorium Dome of the Ambassadors Theatre in May 2018 - Photo M.L.